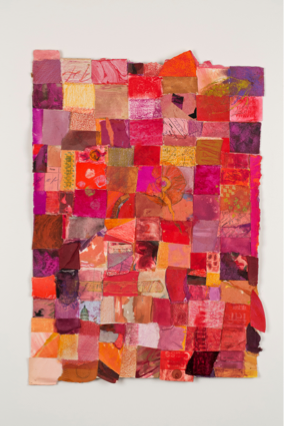 ABSTRACT: In a conversation between Jungian analyst Katherine Olivetti and artist Sigrid Burton themes are touched upon concerning color and the influence on Burton’s work of her travel to and study of India. In addition a discussion of the influences on the artist’s life are considered. Katherine Olivetti (KO): I know that India had a great influence on you artistically. In preparing for our conversation today I went back through some of the photographs I took when I was in India. I titled the file “Colors of India” because I was so moved by the range of colors everywhere, from the sublime to the, well let’s say, riotous. Some of the images I found in my cache resonated with some of your new work. Sigrid Burton (SB): Yes. India has been a major influence in my work. I first traveled to India as a tourist with my mother in 1990, after my father died. We went through Northern India, Rajasthan, and Varanasi. I was enchanted. India is the only ancient civilization that has survived as a continuously living culture. Pharaonic Egypt and Ancient Greece exist only as monuments. They are very archaeologically interesting but there is no current context for how people actually lived their lives. In China, the Cultural Revolution exorcized any remnants of what was left of the long Buddhist thread that ran from ancient times. But India, notwithstanding, various socio-political upheavals and changes, is a continuum of the same cultural and philosophical stream for millennia. KO: I hadn’t thought about it that way, but it’s true. I wonder if that’s what makes India such an infectious experience. Suddenly you’re dropped into something eternal, even if unfamiliar. SB: My first trip to India was mind blowing. I had never studied much about India when I went there. Growing up in California, I was aware of and very interested in Pacific Rim cultures, especially Chinese and Japanese. I had always found the arts of India inscrutable, particularly the sculpture—all the arms, heads, twisted bodies—I had no idea what it all meant or how to look at it. But, then, context is everything. On the first day of my first trip to India I went to the National Museum in New Delhi and I saw the Ajit Mookerjie Collection of tantric paintings. These were small works on paper, mostly from the seventeenth and eighteenth centuries. While many of these images looked like modern or contemporary art; they are actually images of cosmologies and cosmic origins, the subtle or etheric body, yantras, and mandalas. Some of these paintings looked like marvelous works by Paul Klee and other modern and contemporary painters whom I admire. The images were wholly abstract, immediate and direct, but were painted in the seventeenth century. I wondered, what are these and what do they mean? Obviously it wasn’t art for art’s sake. I did not know what they intended to represent or how I was meant to understand them. On a visceral level, they were captivating. I wanted to know more. Who made them? Why were they made? Seeing that collection was a completely transformative experience and set the stage for my ongoing interest in and study of Indian philosophies and art and aesthetics. KO: In other words they aren’t created as decorative objects or as individual expressions. SB: Right. They aren’t created as pieces of art; they are ritual diagrams and/or didactic. Jung was very interested in this material. I remember seeing images that Jung’s patients made that were very similar to mandalas. Mandalas are ritual maps, aids and guides to contemplation. It is interesting that these patients, who were disturbed made images that were so similar to mandalas. Perhaps these diagrams helped to center them when things were very chaotic. When I got The Red Book and looked through it, I noticed that Jung’s own artistic imagery bore a resemblance to or resonated with many of the images Mookerjee collected. Maybe Jung saw some of this material when he was in India. But, to me, the amazing thing is that the people in his practice who made the images, the mandalas, had probably never seen these ritual diagrams. His patients hadn’t been to India. KO: Yes. They were spontaneous productions of the psyche. When their minds were chaotic and destabilized, the impulse to draw the mandala came as a compensation, stabilizing, centering impulse from the unconscious. SB: This is also clearly some type of deeply rooted cross cultural, trans historical expression. We see this similar imagery in so many disparate cultures from Navaho blankets to Hindu yantras to medieval labyrinths to Aboriginal art. The common organizing principle expressed is essentially a grid. It’s possible to unify all kinds of disparate ideas and materials with grids and there’s a liberation in geometry and symmetry. KO: So what happened after that first trip to India? SB: Having soaked up that first experience of traveling in India, I had an intuitive window into what the art and ritual might mean. After that trip I started studying and returned the next year on a trip through the South. I became very engaged and applied for some grants so I could spend concentrated time in India. In 1994, I was the recipient of an Indo-American Senior Research Fellowship (through the Fulbright Scholar Program for Faculty and Professionals) that made it possible for me to live and study in India for about five months. My project was the meaning and use of color in traditional Indian art forms. One of the most interesting things I did during my fellowship was to meet with a Dhrupad singer in Nizamuddin, an old neighborhood of Delhi. Dhrupad is an ancient Hindu devotional musical art form. During the Mughal period, it was much admired and practiced in both Hindu and Muslim courts. This artist was one of many in a long family line of Muslim singers stretching back for generations. We discussed the importance of color to his practice. He described the different tones and their locations in specific areas of his body. Each tone had its own color, which he visualized while singing. This is similar to yogic practices—the visualization of various chakras, each with its own color and energy. The visualization of colors, for this musician, was an integral part of his practice and musical tradition. This relationship to spiritual practices is also true of traditional visual art practices I examined. The artist puts him or herself into a concentrated state to receive and to come into a certain creative state of mind; the imaging of colors can be an important component of these practices. I’m agnostic, so I don’t like to get too tangled up talking about god, but, for myself, I think during the creative process there are these moments of intense focus which are inspired, and feel wholly outside oneself. KO: When you studied in India did you find that the colors had particular symbolic meaning? Traditional meaning? SB: My work has always been involved with the expressive qualities of color. Colors resonate uniquely and individually; they are their own language. The perception of colors is its own experience and communicates something that cannot be felt or perceived in any other way. I find in India, life is expressed through color. To answer your question, generally color codes come from texts and there is a lot of regional, cultural, and other variation. Texts depend on language and the meaning of the word whereas color, as its own physical entity, is a much more fluid construct. It depends on many things, the artist’s interpretation of that color, for example, which, on a practical level may be restricted to the available mineral pigments of the region where work is made. Or what a particular group or individual thinks the word “green” or “blue” signifies in terms of the perceived color itself. There are only twelve to fifteen terms for color that we use in a common vernacular, and probably a couple hundred terms that can be used for more specificity. But the eye can perceive infinite variations of color. Both perception and description of color is highly personal, individual, and idiosyncratic. If I talk about a certain red, to another person it’s purple. Some people may visualize a tomato red, an orange red, while I might be visualizing a bluer red, a vermillion, or fire engine red, and even within these more precise color terms there is so much variation in the individual perception of an actual color that to try to match a specific physical color to a term or word for color is not possible. In a very broad sense, while certain color terms may be traditionally associated with specific arenas, for examples, planets or seasons or times of day, to try and nail down what is signified in terms of an exact hue, tone, or saturation of the color is not possible; it isn’t standardized. That being said, in India there is a color for winter. KO: But when you say they have a color, for example, for winter. Is there one color that is representative of that season? SB: No. There’s a poetry and a personal experience of color that is the more critical aspect; this is more evocative than the specific color codes. For example, there’s a color called shyam, a Sanskrit word. It’s the color of Lord Krishna and is often translated to mean black. Krishna is always described as dark or black or blue, sometimes he’s depicted as a bright turquoise, but in texts that describe him as shyam, it is further described as the color of the evening sky during monsoon season just before it begins to rain. A very evocative description, further, monsoon season is traditionally romantic, a time for lovers; Krishna is the Cosmic Lover. Shyam is a blue-black, this wonderful deep, saturated hue, not a flat color. In a painting it takes layers and layers of color to arrive at the translucence. By contrast, white is understood as the absence of color, a non-color. Widows and others who have withdrawn from life wear white. KO: To me, sometimes color registers almost like taste, there’s an inner feeling of pleasure and satisfaction, as if, like food, it hits certain spots inside and raises a response. SB: Color is its own particular language and is expressive and evocative in ways that cannot be felt or understood in any other way. Color has a physiological dimension. Red, in fact, is stimulating; the experience of red actually increases your heart rate. Certain colors, like the blue-green family, are calming and lower blood pressure. We associate our feeling and emotions with color. We see red. We get blue. The neophyte is green. The coward is yellow. I’m tickled pink or maybe the black sheep of the family. Who wants to miss a golden opportunity….and so on. KO: Color is so important psychologically. Dreams often have colors that are very specific and meaningful. I remember a woman I worked with who could only remember one thing about a dream, the color. She wanted to dismiss it as insignificant, but when we worked on it, and found her associations to the particular color, it unraveled many interesting and significant emotional events. SB: Scientists have determined that, in general, women are more sensitive to and perceptive of more subtle variations in colors. In the book Chromophobia, author David Bachelor discusses the Western cultural bias against color. His thesis is that in the West we are dominated by left brain thinking—linear,, logical, analytical and masculine, and biased against right brain functions which are intuitive, emotional, feminine, and colorful. He uses as an example the film, The Wizard of Oz. The movie opens with Dorothy in Kansas—black and white, dull, and grim. Then she lands in Oz, and suddenly everything is whacky, child-like, magical, fantastic, and in color. She makes her hero’s journey through Oz. During the course of the film, she matures, and wants to return to the “real” place—home, black and white, rational, grim, Kansas. His thesis is that in our culture we tend to associate color with femininity, frivolity, and irrationality. In film, “serious” movies are in black and white Color is often debased in our culture and often negatively associated, for example, green with envy, or purple with rage. I think there’s something to be said for his point of view. There can be something incomprehensible about the way color is used in India for those of us who have grown up in the West. Here in most serious New York City, we wear black. Would you ever dress for a serious business meeting wearing hot pink? KO: Recently I had an experience about wearing color. I was on a plane, working on an article for the Journal that had beautiful, colorful images. The woman next to me couldn’t resist talking about the images and their color, and was captivated by one of them. We began to chat, and it turned out that she was an energy healer who worked with color. As I was traveling, I was dressed completely in black! Awkwardly, I laughed and told her that I wore black because it was my way of making sure the tea or food I spilled didn’t show! But she responded that wearing black is actually the way we protect ourselves from absorbing energies around us. I wonder if maybe that is also part of the seriousness of black and white? Maybe where people are so close to one another, the dark colors shut things down….although as soon as I say that, I think about India! I guess that shoots the thesis. SB: Wearing bright colors puts you out there; I can feel more self-conscious when I’m wearing Them. KO: Tell me, when you came back from your fellowship in India, did it change the way you painted? SB: The experience of viewing the Mookerjie Collection my first day in India profoundly changed the direction of my life and my work. Also, during my travels in India, I was captivated by the ephemeral ritual diagrams that the women make every morning on their doorsteps, in their homes, and in the temples. There is distinct regional variation; this type of work, always executed by women using colored powders, is variously called rangoli or kolam or muggu. As I investigated these various Indian art forms, I began to work with grids, both implicitly and explicitly. I did a series of works in which I imagined my personal subtle body and chakras—what they would look like, what the colors might be, how they were aligned. There were several key ways that my travel in India and my study of its art forms influenced my thinking about both structure and color and their relationship to both content and context. India has an aesthetic of horror vacuii, fear of empty space. Max, my husband, describes the experience of travelling to India this way: the first day there’s so much going on, he doesn’t know where to look, his head starts to spin around, by the second day his hair catches on fire, but on the third day his head explodes, he capitulates to the experience. And from then he’s fine for the rest of the trip! KO: That’s a perfect description! Having been to India a couple of times, I know exactly what he’s talking about. When you first arrive in India it is overwhelming, but I think what you said earlier is relevant. You suddenly find yourself transported to a culture that goes straight back centuries, where the sensibilities are so different and unfamiliar, where the spiritual continuity reaches back in time, and is so different from our Western sensibilities. It’s alive in a very unfamiliar way. This reminds me of a quote from Heinrich Zimmer where he says that it is only by journeying to a far away place, a distant or strange land where one finds the answer to one’s spiritual quest. He says that only a stranger can give you what the spirit longs for. It makes sense that a journey to India is where one might find that. What I remember of what he said is that the symbols and images of an unfamiliar culture is often the way the numinous energy penetrates the heart. SB: So true. That Zimmer book was one of the first things I read after visiting the Delhi Museum and have reread since. There’s something so engaging in how rich and layered, how visceral the experience is in India. After my fellowship, I needed to contextualize everything I had experienced, so I went to Columbia University for a Masters in South Asian studies. KO: Let’s go back farther. When you were growing up did you always know you wanted to be an artist? SB: I always loved getting dirty; I am a very tactile person. I love the physicality of painting, the materials, the smell of the paints and mediums, and of course, the visual seduction of all that color. I like making things and really enjoy work with my hands. When my work is going well there is just no experience like it; it is very immediate, a heightened state of mind, seamless, and transcendent. A fellow artist once talked to me about her painting which she made solely on the computer. This was in the late 1980s; she was an earlier adopter. She was so fascinated by the endless possibilities; she could save her work as she went along, resize it, make it a different color, superimpose and image and then remove it, etc. I couldn’t imagine what that was like. When I’m working on a painting or a work on paper, I might feel smug and think, this work is just right. Then I think, well, maybe that one corner is not right. I start to “fix” the corner and suddenly that corner starts bleeding into the rest of the painting, and the whole thing is changed. There’s no return; it is now something other and different and the earlier state and cannot be retrieved. The ephemeral, yet final, nature of putting paint and marks on paper or canvas appeal to me; it is frightening and exhilarating all at once. You’re all in or you’re all out. Sometimes out of those incidents and accidents comes something wonderful but at other times you have to let it go and move on. To me it would be an endless trap to be able to go back to a previous version on a computer. If I could always go back and “correct” what I’ve done, I could never move forward or finalize. KO: When you were little, did you play in a sandbox? Paint? How was it that you were so comfortable that way? SB: My parents always encouraged me; I grew up in Pasadena, California. Both my parents and grandparents were enthusiastic and adventurous travelers who instilled in me and supported an active curiosity in exploring the world. My parents were very involved in the Los Angeles art community and when I was growing up, the Pasadena Art Museum (now the Norton Simon). It was a marvelous place and a very progressive institution where I took classes taught by practicing artists from a very early age. Marcel Duchamp’s first retrospective was held there in 1963 which, lamentably, I do not recall. I do well remember both the Joseph Cornell and Kurt Schwitters retrospectives; these artists have been an important influence. The museum had the extraordinary and important collection of Galka Scheyer, a German-American art dealer who founded the Blue Four, an artists’ group including Jawlensky, Klee, Kandinsky, and Feininger. There were several artists in California, working in collage and assemblage, George Herms, Bruce Connor, and Ed Keinholtz among others. There were another group of artists, loosely referred to as Light and Space, including Larry Bell, Robert Irwin and James Turrell. The school I attended from the eighth grade, was a small independent girls’ day school with very strong emphasis on the arts and, again, our classes were taught by practicing artists, writers, and musicians. One of my teachers was Barbara Turner Smith, a performance artist, who is now getting some well-deserved attention; Karen Neuberg was another. So I was extremely fortunate in my exposure to art from an early age. KO: Where did you go to college? SB: I started at Berkeley in 1969, because I’d gone to this small girls’ school, and. I wanted to have the experience of a large University. I got there and was completely overwhelmed. It was a very turbulent time, the height of the Vietnam War and Ronald Reagan was California’s governor. He ordered the National Guard to fly over campus with crop dusters and drop tear gas over. It was a difficult learning environment, to say the least. So I left school. I had always wanted to go to school on the East Coast; I had once been to Vermont for four days and thought it was a really “cool” state— So I looked up schools in Vermont in a guide to colleges and universities and found Bennington; I had never heard of the school but it sounded like my high school, a supportive learning environment, small classes, with a very low student to teacher ratio, which, after the scene at Berkeley, I appreciated. KO: I bet it was a good fit. SB: It couldn’t have been a better decision, which changed the course of my life, but looking back it was so arbitrary! Bennington has a non-resident term every winter. In my senior year, Helen Frankenthaler, the painter, who attended Bennington, came up to the college and conducted a master class. I asked if I could work as her assistant during the winter non resident term and she accepted. She had a pull out sofa in the basement of her studio, so I lived there for the winter, and made a job for myself. After I finished at Bennington, I worked for her for a few years. That’s how I came to live in New York City. I don’t know how your life story unfolded, but when I think about all my critical decisions, they seem very capricious and arbitrary, but they were all leading me where I needed to go. Fortuitous circumstances. KO: Right. Like an accidental plan. SB: Do you remember the movie Shakespeare in Love? Nothing is going right. There’s no theater. There’s no play. The Geoffrey Rush character is asked, “How is it going to happen?” and he responds, “I don’t know; it just does.” It is like the sensibility in India. Everything is chaotic. Nothing is obvious. You wonder. How are we possibly going to get from here to there? How will it happen? It’s not at all evident, but somehow it all falls into place. KO: Before we spoke I looked at the images you sent me, and it inspired me to go through some of the photographs I took when I was in India. Some of them evoked a feeling very much like what your new work did. The blue patchwork of Jaipur reminded me of your collages. SB: This is what I mean about the timelessness of India. You can’t imagine there is a population issue when you look at this picture. KO: Yes. The contrast, for example, with Varanasi which is indelibly etched into my mind. The pyres and flames, the thick, smokey air, the dogs and goats wandering around charred heaps while the embers cooled, and the filth. SB: It is one of the holiest cities. KO: I didn’t have the sense of sacred and holy, rather it was intense and upsetting. The visceral qualities, smell, sound, texture of the burning sights was so penetrating, and also, watching the burning of the bodies felt voyeuristic, as if you were intruding on a most personal and intimate moment to which you had not right to attend. It was hard to watch and equally hard to tear yourself away. SB: It’s so different from our traditions of death. Most often I attend memorial services where there isn’t even a body present. But I remember going to a friend’s funeral, a man who was an Orthodox Jew. There were very tactile and visceral rituals involved like the rending of the clothing, and the burial in the pine box. It was very intense, not all sanitized like Protestant services. It was a rich ritual like Varanasi. KO: We’ve drifted from your art, which is so vibrant and lively into this darkness and death place. SB: It is Varanasi. It was fascinating, but also so dark. KO: It’s an intersection—life and death are meeting here—and you’re not supposed to go there, particularly as an observer. It’s like a conversion spot where the visceral and spiritual are so entangled and you’re just not supposed to look directly at it. SB: Such filth, the burning of the wood and flesh, so squalid with beggars, animals roaming around and their dung in the streets. Then you go down at dawn to the ghats in all this mayham and chaos, and on the other shore, across the Ganges, there’s nothing but pristine landscape. It’s a living metaphor for crossing over to the other side. It’s such a hub of frenzied activity on the one side, yet on that far shore there isn’t a building or a hut, not a goat or cow, not a piece of sari hanging, nothing. It is unlike anywhere else in India. That was extraordinary to me, the literalness of it. KO: That seems so characteristic of what you see there, the concrete and the literal is emblematic and symbolic of the more abstract and spiritual. Something like you scratch the surface, and what you find underneath is just what is on the surface. SB: Yes. It’s all embedded, a philosophical construct that is a thread that runs through the whole thing. In the Hindu temples the main activity is circumambulation, you move from the exterior, closer and closer to the center. The outside is incredibly ornate and as the devotee processes through the environment he or she becomes more and more focused until s/he arrives at the Garbhagriha, the so-called womb chamber of the temple. This is often completely stark and unlit. The icon found there may be an abstract representation. Shiva will be a lingam or yoni, rather than one of the anthropomorphic representations. KO: It’s like a visual representation of the meditative process. SB: I am really interested in this notion of process and practice which arose from my travel in India. The creative process is like both the psychological and the spiritual process. When I’ve been in therapy, the process is the content and the context and the product. The making, the thinking, or the doing—that’s all there really is. I don’t care so much about the production of an end product except in so much as it informs what direction I am going in. Once I’m done with a painting or a work on paper, I’m done with it, although I do go back and change them. Recently, after living for forty years in New York City, we moved; we had this tremendous amount of stuff. I’ve started recycling my artwork. I love working in collage because each little piece of paper has a history. Some of it means a lot and some means little. I love ephemera. Recently, I’ve been tearing up old drawings and repurposing them into my new work. I had a close friend, Marty, who was an artist, he died of AIDS in 1989. He worked in collage but in a very different vein from my work. After he died his brother gave me his materials and they were very different than the things I would save and collect. I have some of his material left, I used to keep it segregated, and intentionally use his materials in a kind of “collaboration” but now it’s all mixed up. I recently used a lovely fragment of his to complete a work. Another important source of material were my grandparents scrapbooks. They traveled all over the world from the Thirties to the Seventies and saved every coat check, matchbook, railway ticket, menu, every sort of useful material. I save lots of materials from my travels and friends give me things. In that sense, some of my work is biographical or autobiographical. If you look closely at the smaller bits there are often little surprises, an intention behind the choice of material I use in the works. Sometimes it’s purely aesthetic but oftentimes, literal. The works are accessible viewed from afar as a totality, a (hopefully) compelling image and viewed from close up reveal many small distinct arenas of interest—a macro and microcosm. KO: That reminds me of an analytic process where you go back. You think you’ve finished with something, or what you’ve achieved is wonderful, but then later you have to disassemble that and, again bring about something new. You go back over something many times, and find something new again and again. SB: Yes, using something from your past—maybe just the bits you like! KO: Well, or sometimes, it’s reclaiming a bit you don’t like. I’m thinking of a woman I worked with who didn’t like to go slow. She sort of threw away that part of herself, but she came to a point in her life that something in her was slowing her down, and she had to reclaim that rejected part of herself. SB: Using what’s been rejected. That’s what I’m doing now. Maybe because we are living close to the sea, but I got some old nautical maps at a yard sale, all stained and torn, and I’ve been using them in my new work. Maps tell you where you’ve been and where you might go. They’re gridded with numbers to show the various depths. I thought they were a good metaphor for my life. Old and obsolete! I don’t mean that to be so harshy negative. Realistically, I’m at a stage in my life that certain options are closed to me. As a younger person, one feels there are always endless possibilities, that one can change course and reset. Later in life it becomes clear that the roads taken have less diverging opportunities. KO: I guess the way I’d put it is that there’s an intensification of who we are. We’re more specific or distilled. I am this, and only this. Maybe this is where we need to end—with the idea that over time we become more and more like your collages—a beautiful assemblage of bits and scraps, some that we’ve thrown away and reclaimed, others that have been there all along, but in the end a very unique combination of elements. Sigrid, thank you so much for sharing so much of yourself, and so much of your art, with us.